Editor's note: Kylie Masse wrote this piece prior to breaking the world record in the women's 100-metre backstroke and becoming the first Canadian female swimmer to ever win a world title. As I sit and stare at a blank screen, with a deadline looming, I realize how difficult a task writing about myself is. Not because I don’t know my story or I forget the details, but because talking about myself is something I have never really been comfortable with. You may not have heard of me until you saw me on the Olympic podium and you still may not know me, but my story did not start with that medal in Rio. My story — or swimming story — begins like many of my peers, with swimming lessons. Every summer from the age of three, my brother Daniel, sister Natalie and I took swimming lessons. My parents signed us up for a summer swim team. We were all officially LaSalle Lizards for the summer months. It was fun. We got team T-shirts and the swim meet days meant lots of freezies and hot dogs. The swim team became a ritual of the summers. When I got to Grade 4, I tried out for the Windsor Essex Swim Team. My life as a competitive swimmer began. I also played hockey, soccer, and joined most of the sports teams at my grade school. I was an average athlete. I was small for my age and a little bit of a klutz, not exactly anyone’s prediction of an Olympian. I was part of the Windsor team at the International Children’s Games (ICG) in Greece and in Scotland. Those were my first tastes of the opportunities that swimming would present to me. Scotland was also the beginning of my success in the pool. When you are a kid you just do things you like and you feel you are good at. Swimming made me feel this way and I loved racing. My parents often say they saw me become a more confident person with swimming. Swimming seemed to help me become a better student as well. In high school I swam for 12 hours a week in a 25-yard, six-lane pool with anywhere from eight-12 people per lane, and did three hours of dry-land training. Attendance was never taken. We came to practice because we wanted to swim, see each other and have fun. I was my own person, following my own path. At the time, I never focused strictly on one stroke, and I would not have considered myself a backstroker. Breaststroke was always a struggle but I loved butterfly. A dream growing up was that I wanted a swimsuit with the Maple Leaf on it. I qualified to attend the 2012 Olympic trials where I finished 99th in the 100-metre back. I made a couple of Swim Ontario teams, including the team for Canada Games. Outside of the pool, I enjoyed music, dancing and fashion, a typical high school girl. Around Grade 12 I had to decide how seriously to continue swimming. Could I see myself doing this throughout university? I was considering a career in healthcare. Would it be possible to swim and do what I needed in my undergrad to achieve this? I looked at universities in both the United States and in Canada. Ultimately, I decided to go to the University of Toronto to swim and get my undergrad degree in Kinesiology. Little did I know that this decision would change the direction of my story. I was ranked 201st in the world in the 100 backstroke heading to U of T. I was a decent fly and medley swimmer but backstroke was a hit-or-miss thing for me. I loved the university team atmosphere. What is not to like about having 50 immediate teammates and friends? I had a great first season with the Varsity Blues, better than I could have imagined. April rolled around and the Pan American Games trials were here. Toronto was hosting both the trials and the Games. To compete in that Maple Leaf suit of my dreams on home soil would have been super cool. I swam an incredible preliminary 100 backstroke and went into finals as the top seed. But I let myself slip and lost control of my thoughts. I started to think too much and the nerves got to me. In finals I placed third, putting me off the team for the Pan Am Games. Those trials helped me realize the mental capacity and stability needed to compete. I learned a lot about pressure and nerves and I earned a spot on the World University Games team that summer. I went on to win the 100 backstroke in South Korea. This was my first real indication that the Olympic team could be a goal. I swam my own race and had fun; it wasn’t until after, when I got some recognition on the Internet and social media, that I realized my time was significant in world standings. I remember a few days after the race, getting shout out tweets from two Olympian role models — Julia Wilkinson and Brittany MacLean. I had no idea they even knew I existed! I coveted those tweets for months. My coaches Byron MacDonald and Linda Kiefer set out a plan. I went to a high-altitude training camp, planned my meets, school, swimming, dry land and physio appointments, all with the end goal of making the Olympic team. I swam a best time in the preliminaries at trials and bettered it in the finals. I had done it. I had made the Olympic team, but I hadn’t done it alone. Coaches, teammates, support personnel at the University, professors, classmates, friends and family, all contributed to where I was that day. I will always be grateful for all the support. The summer was laid out for me. A few small meets in Toronto, a weekend at home in LaSalle, Ont., and Italy in June for a high-calibre international pre-Olympic meet. We got our Speedo kit for the pool deck. It was like being a kid in a candy store holding that Canada cap with my name on it. We landed in Rio and got our Team Canada Hudson’s Bay uniforms (more excitement, more stuff!) My teammates and I talked about how the Olympics felt like just another swim meet. But it was also incredible to think we were really there. The Olympic Games were hard to piece together or put into words. It had it all. Racing there was awesome, especially because I was able to wear that Maple Leaf everywhere I went. I had learned not to put pressure on myself and to focus strictly on what I could control: completing a smooth start, two speedy lengths of backstroke with a quick turn in between and a great finish. Now it was the Olympic final of the 100 backstroke. But I was not telling myself that, rather look up in the crowd, look for the Canadian flags, my teammates and my family and to have fun. I was going to do the best I could — and that’s what I did. Now I have a bronze medal to my name, and memories for the rest of my life. 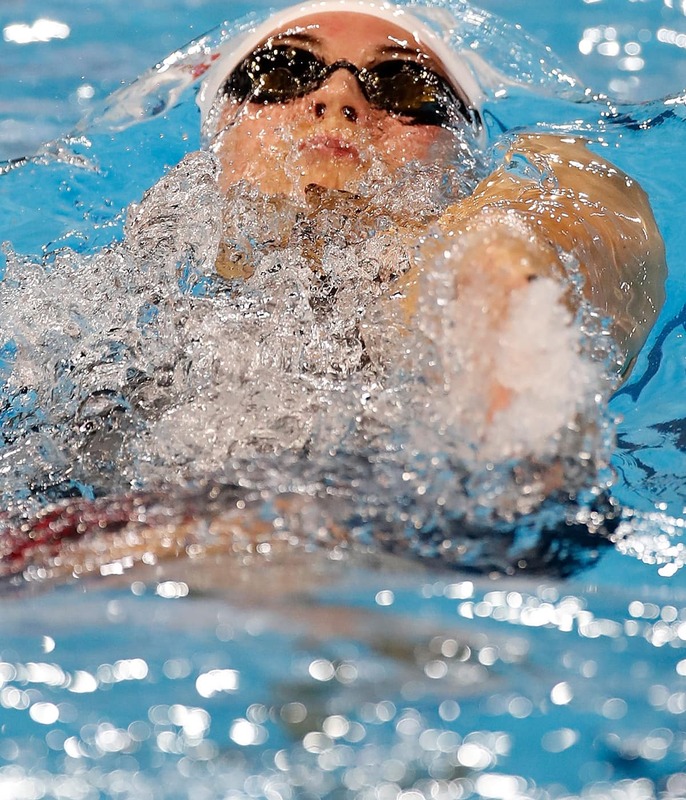 Kylie Masse swims to Olympic bronze. Post-race I was inundated with interviews. There were questions about the sport itself, questions that I had never really put into words before. Swimming was something that I just did and loved, but I show up to the pool, do my thing and when I’m done, I move on to the next thing. I have a tendency to compartmentalize swimming in my life. I enjoy doing other things as well: adventuring around the city, finding hidden coffee shops, jumping into a dance class or going to school. These activities help me to balance swimming in my life. This year has been a bit of a blur, but for the first time in over a year I finally have had the time to sit back and really think about and appreciate what has happened. I am one very lucky girl. Everything is the same, but also nothing is the same. I am the same person. I like to blend in with my classmates and teammates and be one of them. I will still do a drop-in dance class and I still love music and fashion. I managed to squeak out my G drivers test in the nick of time and I work hard at school. I don’t think a lot about swimming outside of the pool, I leave that to my coaches. Swimming has taught me that you must find something that you enjoy and that you love. I believe that every time I race it is a learning opportunity. Everyone has what works for them. I try to always keep a positive attitude. I trust the process, my coaches and support systems. No one ever got to where they were going alone. This story is my story. There are multiple ways to achieve your goals but if you follow your gut, be your own person and enjoy the ride you can achieve whatever you set your mind to and you could be very surprised where it will take you. I am that same girl from LaSalle, Ont., who played multiple sports, was an average swimmer and student who kept her head down and just kept working. Some things have changed though. I don’t panic the way I used to when I see a TV microphone or have to do an interview. As a Canadian Olympian and an Olympic bronze medallist, I am getting better at talking about myself and sharing my journey. And I may even be getting over my writer’s block — although the jury is still out on that.